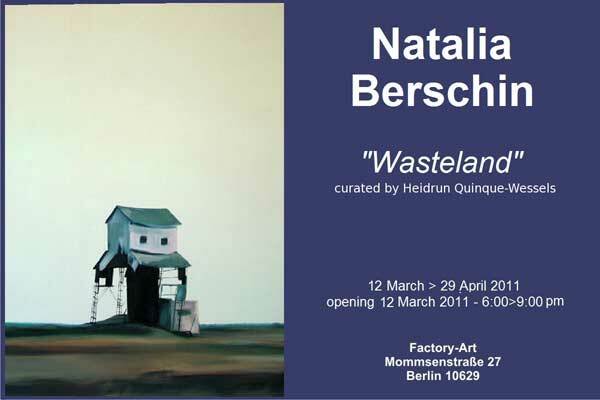 Natalia Berschin’s solo exhibition "Wasteland" opens on March 12, 2011 at Factory-Art gallery in Berlin, Germany and will be on display through April 29. All of the showcased artworks are interlinked by one theme - the disaster occurred at the Chernobyl Nuclear Power Plant in 1986. The text below is from the catalouge's foreword written by Heidrun Quinque-Wessels and translated in from German by Frank Siebold. “Natalia Berschin was 10 years old when one of the nuclear reactors of the Chernobyl Power plant exploded on the 26th of April, 1986. A sudden power output surge took place, and when an attempt was made for emergency shutdown, a more extreme spike in power output occurred which led to a reactor vessel rupture and a series of explosions. This event exposed the graphite moderator components of the reactor to air and they ignited. The resulting fire sent a plume of radioactive fallout into the atmosphere and over an extensive geographical area. One day later, on the 27th of April the inhabitants of Prypjat were evacuated, the town where most of the employees of the power plant lived. 48.000 of them were immediately evacuated, later on more than 300.000 from a wider region. The disaster was at first played down by the Power Plant Management. The inhabitants were left believing they could soon return to their houses. They could not take their belongings with them. This and their animals were left behind. Even the political leaders in Moscow were not sufficiently informed. Photos of the place of disaster were only shown in the media after they were beautified. Natalia Berschin was living in Minsk, only a few hundred kilometers away. Minsk was part of the area that wasn’t polluted by the nuclear fallout. Evacuated persons and refugees from the surrounding of the exploded reactor came to Minsk and influenced the fantasy of the child. Around the years 2006/2007 Natalia Berschin began to look into the Chernobyl disaster. The research of texts and pictures documenting the disaster took one year at the end of which large impressing paintings where she incorporated the assembled material as well as her own visions: left-alone houses, empty rooms, a giant wheel and a car scooter, about to be opened, contaminated and abandoned military vehicles and ? 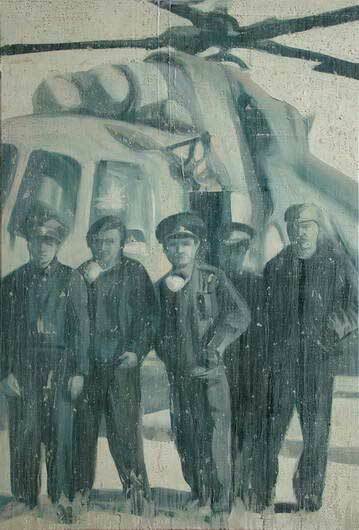 helicopters, men in uniform and protective gear. 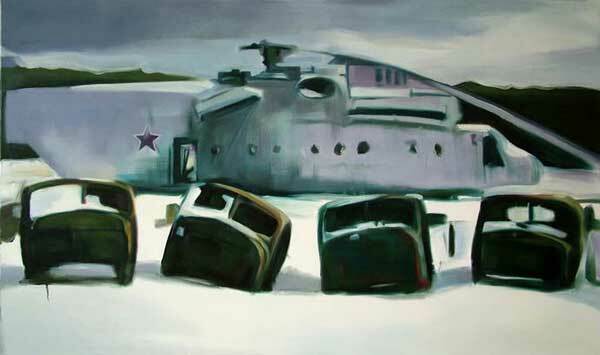 Titles like ‘Debris of History’ (‘Schrott der Geschichte’) that were given to several paintings and ‘Heroes of Labor’ (‘Helden der Arbeit’) and also the painting of three young pioneers indicate that Natalia Berschin in her work cycle ‘Wasteland’ not only points at the disaster but also at the coincidence of the surge of the communist bloc. When the reactor exploded the soviet union was already about to doom. Cover-up, disinformation and forgery of material of documentation seemed to be an accepted way to deal with reality. The question of a peaceful use of nuclear energy is continuing to be part of public discussion. At the moment there still is no sustainable concept for renewable energies. Chernobyl remains to be a symbol for the danger of nuclear energy. The power plant was closed in 2000 as a result of international pressure. Today people are living in the surrounding again. The region seems to be a paradise of nature. The contaminated helicopter and military vehicles that were used to pacify bloc 4 and the evacuation have been scraped out and moved out of the closed district, despite security patrols”.